In Flokzu searches have high priority because we know that often your efficiency depends on how fast you find what you need to complete your work. In a quotation process you need to revise similar proposals sent to customers. In a hiring process, before interviewing the candidate you might want to re-read the resume. When placing a purchase order it may be helpful to consult the purchases from previous months. There are many examples like these. By finding the right documents you can speed up your work, avoid making mistakes and coordinate teamwork better. One way to improve your searches is using search operators. Another way is through Advanced Search. Keep in mind that you must enter at least one search criteria. If you enter more than one, the results displayed will be those documents that match all criteria simultaneously. 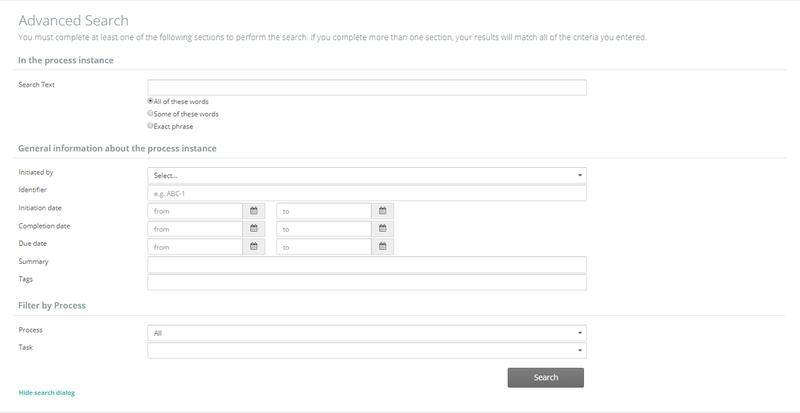 After performing a search the search criteria applied will be displayed. If you select a process and a task, then you can filter by the form fields that you want to search for. In order to complete their tasks, users must complete the form fields. 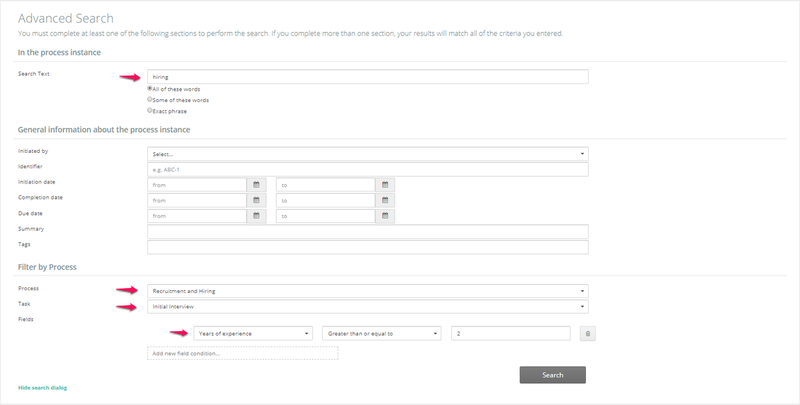 Searches will be carried out over the values your users completed in the form. If you enter several field conditions, you can select whether conditions should be applied in an exclusive manner (or) or simultaneously (and). Keep in mind that not all users have permission to export search results. This action can only be carried out by users that have the Administrator or Business Analyst roles.